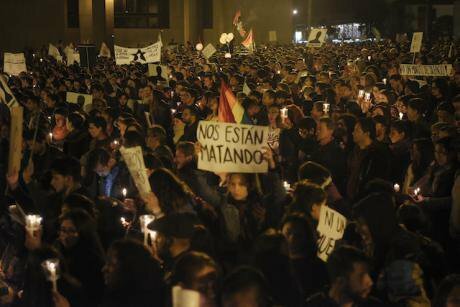 Rally against the unpunished assassination of community leaders on July 6 in Bogotá. Image: Tomás Mantilla for ¡PACIFISTA!. All rights reserved. Colombian society, following the death of up to 7 community leaders in less than a week, took to the streets last weekend to demand, with a massive velatón (candlelight vigil), an end to the killings and an investigation into the murders of more than 311 social leaders since January 2016. 1 – Constant uncertainty: nearly 40% of the murderers are unknown and practically no investigation has managed to clarify any of these cases or punish the perpetrator. Some patterns exist which lead us to believe that these are in fact systematic killings – which is something that the government refuses to acknowledge – occurring mostly in the Cauca Nariño region, Norte de Santander and Valle del Cauca, areas historically marked by the armed conflict. 2- This is not a new phenomenon: for several decades, systematic violence in Colombia has taken the form of this type of action against human rights defenders as a way to persecute and put an end to social movements of the left. Cases such as the genocide of thousands of members of the Patriotic Union in the eighties and nineties are useful to understand that the current murders have some disturbing precedents. 3- The peace agreement appears to be the main driver: several organizations have denounced that one of the aims of these murders is to prevent the advance of post-conflict implementation in the regions mentioned above. It appears that the forces established in these areas of the country are reluctant to allow any advance of peace that would jeopardize their monopoly of the territory by unidentified armed groups. 4- The threats are continuous: many of the murdered leaders had been warned and had even reported their cases to the authorities, who could not (or did not want to) guarantee their effective protection. This year, more than 30 human rights defenders have already been killed and the protocols of the authorities are still apparently unable to guarantee that the murders will not keep on occurring. Their impunity is clearly an incentive to continue the massacre. 5- Society reacts to the slain leaders: a broad and diverse part of society has shown its willingness to react, take to the streets and mobilize social media with the campaign #NosEstánMatando, demanding justice and demonstrating its rejection of this systematic violence. Thousands of people rallied in Bogota during this last weekend, and the mobilization spread to several cities in the country showing that this is a matter that has harmed both Colombians and the world. The new Colombian president Iván Duque’s inauguration is due to take place in less than a month. Beyond the demand of due investigation and justice, it is essential that he should listen to citizens and set up specific government measures to ensure his administration will not allow this disgrace to continue. Otherwise, he will end up endorsing criminal impunity and endangering the credibility of his mandate from the very first day.